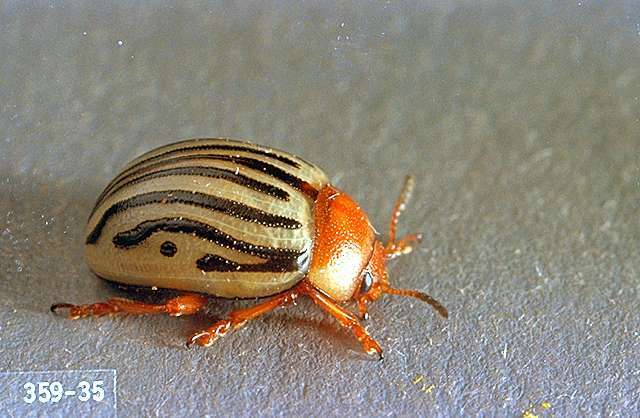 Pest description and crop damage Adults resemble Colorado potato beetle. The head is reddish brown, and the thorax is pale cream with a reddish brown patch at the base. Each wing cover has three dark stripes that extend the length of the back. A shorter, lateral stripe ends at the middle of the wing in a small dot that resembles an exclamation point. The adult is 0.25 to 0.5 inch long. 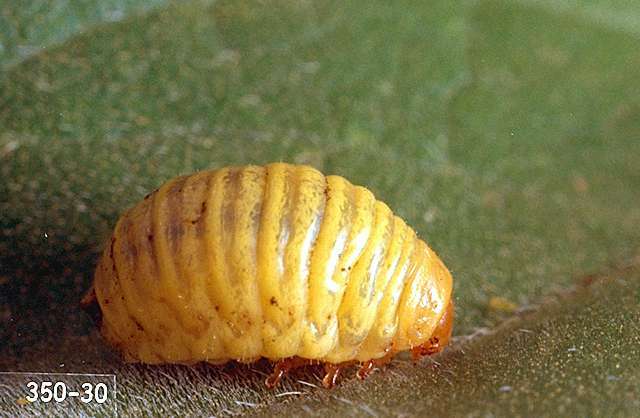 Larvae are yellowish green, humpbacked, and about 0.35 inch at maturity. Adult sunflower beetles damage plants soon after they emerge from hibernation. Damage to cotyledons is generally slight, but the first true leaves may be severely damaged or completely consumed. Fields may be severely defoliated if beetles are numerous. Larvae of the sunflower beetle cause damage by chewing holes in the leaves. carbaryl (numerous formulations of Sevin) at 1 to 1.5 lb ai/a. Do not apply within 30 days of grazing or harvest for forage. PHI 60 days. REI 12 hr. chlorpyrifos (numerous products) at 0.5 to 0.75 lb ai/a. Do not graze or feed treated forage. PHI 42 days. REI 24 hr. esfenvalerate (Asana XL) at 0.015 to 0.03 lb ai/a. Do not exceed 0.2 lb ai/a per season. PHI 28 days. REI 12 hr. lambda-cyhalothrin/chlorantraniliprole (Besiege) at 5 to 8 fl oz/a. Do not apply more than 0.12 lb ai/a per season of lambda-cyhalothrin or more than 0.2 lb ai/a of chlorantraniliprole. PHI 45 days. REI 24 hr.